All Earth & People Friendly! 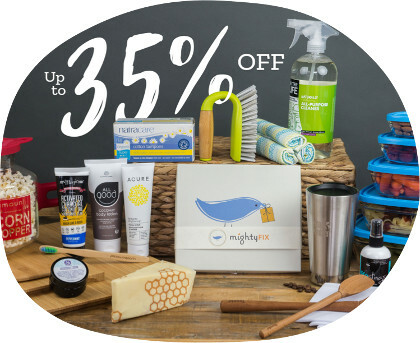 Sign up for the MightyFix and we'll send you a thoughtful, handpicked product each month-always a surprise! Expect green goods for yourself and your home that are high quality, useful and fun. Members get exclusive discounts, too! The MightyFix is truly the most simple, affordable way to make your life greener. You'll be amazed at how fast these new discoveries become the best parts of your daily routine. "Great eco-conscious company. The monthly MightyFix is well worth the price. Each week, we receive a high-quality item that we’ve put into regular rotation at our house (metal straws, silicone spatulas, beeswax wraps, wool dryer balls). MightyNest is helping us take baby steps towards big changes. I also appreciate that I can add items to my monthly subscription and get free shipping. Love this company!" "A great way to try innovative new products & change the world one little change at a time!" "This is such a fun monthly service that makes going green so easy. I have loved every mighty nest item that has arrived and they are products I never would have thought about. It’s so much fun." "I was thinking of writing you because I’m over the moon. I really love all the helpful things I’ve gotten every month and have ordered extras. Thank you Mighty Nest for making my life healthier." "Love it! Look forward to it every month & frequently take advantage of member discounts & free shipping." "Every month they send something that I end up using all the time, sometimes daily. I absolutely love mighty fix! I have no idea how they do it, but a lot of the items are of such high quality that I’m always shocked to be getting them for only $10." "I love getting my “gift” in the mail each month, and have since given subscriptions as a gift to two others who also have told me how much they love the products they have received from Mighty Nest." Can't wait to give these dryer balls a splash of essential oils and throws them in the dryer with my laundry to be able to get rid of my chemical dryer sheets once and for all! Ah! Look at my pretty June #mightyfix box 😍🌈 i think using these instead of paper towels will be pretty easy! Cleaning, drying, scrubbing... can't wait to use them!! I am loving my new bees wraps i got in my Mighty Fix monthly box from @mightynest !!! My first #mightyfix was great! I make one switch to safer each month without lifting a finger! 💪👏🙌 Are you curious how? Enter @mightynest! A #doitbetter brand that offers a whole store of products free of toxins, plastic, BPA, parabens and other big health offenders. The best part is that they have a monthly subscription box that sends you one product a month that you can switch to safer in your home for just $10. Through the Mighty Fix program i have been able to get rid of almost all plastic, found some of my favorite brands, and get tips on how to lower my toxic load. And let me tell you, most items have a way higher value than $10. their home and our world better! How does the free shipping on anything I add work? As a MightyFix member, you get free shipping with anything you add to your MightyFix shipment (only available in US contiguous 48 states). Need dishwasher detergent or sunscreen? Just throw it in and it'll ship for free in the same box as your next MightyFix. When you add an item to your cart, you will be give the option to ship it with your MightyFix or to ship it now. (If you don't see that option, be sure to log into your account with the Login link at the top of the page). At checkout, there is also an option to move any items in your cart to ship with your MightyFix. Feel free to add or remove items during the month and when your MightyFix subscription bills, so will any Add-On items. If I live outside the US contiguous 48 states, can I still sign up for the MightyFix? Yes! We are finally able to extend the MightyFix outside of the contiguous 48 states in the US. For US addresses outside of the contiguous 48 states, we do offer the MightyFix, but cannot offer free shipping on add-on orders. See our shipping details for more details about the shipping discounts we do offer for your state. For Canada and Australia, we now have an affordable international shipping option that makes the MightyFix possible right to your doorstep. A small shipping fee ($3 CAN and $4 AUS) will be applied to each month of the fix for international orders. My credit card expired, how can I update it so that I can keep receiving these amazing fixes? To update the credit card that will be used with your MightyFix: 1) Login to your MightyNest account and go to "My Account" 2) Find the "Billing Information" section 3) Click the "Manage" button and enter your updated card information. You should be able to quickly update the credit card number or expiration date. If you have any trouble finding that option, just call us at (847) 905 - 0567 or reply to one of the MightyFix emails to tell us you need help. I don't have kids in the home, can you make sure my shipments don't have products for children? You're in luck! The MightyFix is always something anyone in the home can use, so we will not include products that are only useful for families with young children. Can I give the MightyFix as a Gift? After much anticipation...YES, you can! Friends and family across the country are going nuts for the MightyFix. 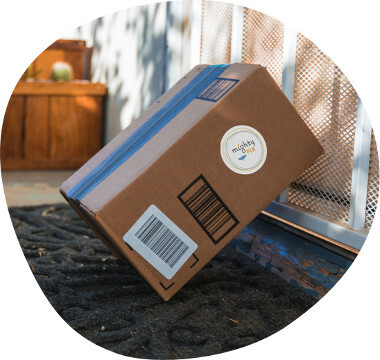 What's especially unique about the MightyFix as a gift is that your gift recipient will enjoy the benefits of MightyFix FREE SHIPPING on anything else they want to add from MightyNest. How's that for the gift that keeps on giving? You can buy gifts from 3 months to 12 months in length and once the last gift is sent, we'll automatically pause your recipient's shipments. How do I cancel my MightyFix? Cancelling is simple. Just login to your MightyNest account, and you can manage your subscription status in two clicks to cancel or pause at any time. 12 Month subscriptions cannot be canceled until the 12 Month period has completed. How does the 12 Month subscription work? The 12 Month subscription allows you to subscribe for 12 months without having to pay each month. It ships free just like the monthly, and it comes with a nice discount for opting into a whole year of fixes. When your 12 months are over, we will NOT bill you for the price of another 12 months. Instead, we simply convert your subscription into a month-to-month account that you can cancel at any time. (Unlike a subscription for yourself, MightyFix Gift Subscriptions pause after the last gift is sent). You are also able to buy another 12 Month Subscription at that time to get another annual discount, and the 12 months of credit will be applied to your account. 12 Month subscriptions cannot be canceled until the 12 Month period has completed. We make it easier for families to create a healthy home. Each of our products has been thoroughly researched to be free of concerning chemicals and hand-picked for its quality and design. Received a gift? Redeem it here.